It was further stated:” The working definition of A MIND is Electro-Magnetic INDuction (E-M IND), i.e. the electro-magnetic phenomena induced by the interference between two different energy phases. In terms of the evolution and creation these phases are referred to as “As Above (Spirit or frequency higher phase) So Below (matter or frequency lower phase)”. In-between the two, the interfering energy phases induce the E-M INDuction (or A MIND) interference planes. In the Supreme superuniverses of time and space there are interferences between the spatially positioned PUMA’s within the morontia (electronic) phase, and the interferences between the morontia electrons within the physical atoms. 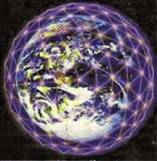 It is that within these interference planes the mind circuits exist, manifest and keep memory. This mind memory records are called in the Eastern teachings - the Akashic records. It has been already stated that in the Supreme universe of time and space the two basic MALE and FEMALE vortex wave-particle energy patterns and minds dominate along the ultimaton-electron-atomic axis. The spatial position of the ultimatonic Male and Female vortices within the electrons (electric ions) determines the charge and polarity behavior of the electronic matter as being positive, i.e. positronic (positive ionic, as in protons), neutral or neutronic (neutral ionic, as in neutrons), or negative such as negatronic (negative ionic, as in atomic negative orbital electrons). Electronic vortex interference within gathered atoms determines the character of the atoms within the periodic system of chemical elements. Therefore the above PUMA M-F energy patterns manifest all the way down and into the geo-magnetic electro-chemical worlds before the primordial electro-chemical cells are initiated and the life begins its spirit prompting mind evolutionary ascension (via the Nebadonia’s initiation mind spark-Adutant Mind Spirit circuits-Life Carriers- carbon DNA organic evolution). It is the Law of the Fittest Spirit-Matter MIND (Electro-Magnetic INDuction) that has prompted, after the Nebadonia’s Mind Spark initiation, the survival of the propagating evolution of different life forms on planets as the cradles of spirit-matter life, such as was on the decimal (experimental) planet Urantia. In this scenario the PUMA vortex MIND itself is induced by the higher frequency universe “imported” mind energy from “within” via PUMA’s 1º, 2º, 3º etc. micro-vortex dynamic “wave-particle” spirals as shown in the Picture 3 A-D.
Toward the “without”, the ultimatons induce within the electrons the electronic intuitive e-m-ind, and the electrons further induce the intuitive electro-magnetic mind within the physical chemical atoms of the in-organic and organic matter within the dynamic universe energy vortex hologram.